Specialising in the BMW 2002 & BMW CS series, Jaymic can offer Classic BMW parts for the 1502, 1600, 1602, targa cabriolet, 2002, tii, touring, turbo, 2.8 & 3.0 CS, Csi, CSA and CSL BMWs. Based in Norfolk, UK, our worldwide mail order service can satisfy almost every need for the 02 and CS range from the sixties and seventies. If you own other classic BMW models such as E3 saloon, E24 6 series, E23 7 series, E21 & E30 3 series, E12 & E28 5 series we are always happy to find parts for you, so please email or phone us for a quote. We are constantly adding parts to these model ranges on the site. Jaymic Classic BMW Parts stock genuine, OE, aftermarket, new old stock and remanufactured parts (some NLA) BMW parts and comprehensive catalogues are available for the BMW 2002 and BMW CS models. Check out our online shopping for a sample selection of popular parts. 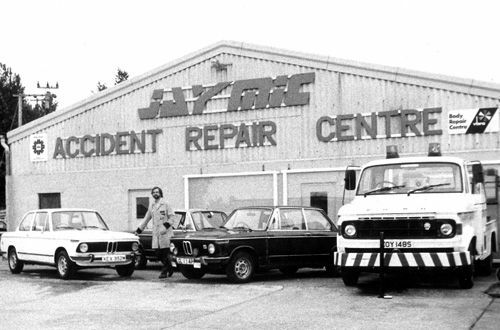 Jaymic is a family business run by Fay Moore and her husband Peter with the help of David. We hope we can assist with our many collective years of experience with Classic BMW Parts. In 2004 my parents, Mike & Jane Macartney, decided it was time to retire from running a business that has established back in 1973. The name "Jaymic" was fabricated by my Dad, Mike, initially as a name for his self-designed and built single-seater race car. He wanted a nice short, "stick-in-your-mind" name, like "Lotus". Mum & Dad were both born in North London, Dad became an electrical engineer after failing his O-Level English about 5 times that he required to become the Architect he had in mind. Always fiddling with cars in his spare time, his boss asked him one day if he and Mum would like to have the chance of running a little Garage in Deal, Kent, that his son had been running into the ground and needed saving. Mum & Dad happily took up the offer and moved to Deal to take care of the Garage, doing recovery work in a big Scania truck. After moving back from the quiet life on the coast to busy bustling London town they quickly got tired of the "rat-race" of the capital. My mum’s parents (my Nana & Grandpa) had already moved away from Finchley in London up to the North Norfolk coast, near where they holidayed as a young family in summer at Mundesley. My parents found a house just a mile down the road from my grandparents. Dad’s own Garage business was started in an old chicken shed at an abandoned railway station in Overstrand (the Norfolk Coast was particularly popular in Victorian times bringing tourists in from the cities by Steamtrain back in the heyday). A few years later they bought the Old Station Yard in Cromer further up the coast, and funnily enough, further up the same disused railway line! Jaymic, as I know it, was built. It was, now I think back about it, quite an adventurously large building. But that’s my Dad, he likes a project to get his teeth into, always thinks big & in great detail too. I was there (in utero) helping to build the workshop. In 1980 I was born into a very car orientated world. In addition to the accident repair work , restoration and respraying my Uncle Alan and some of their friends ventured into the record books with their "Poppy Flyer" a human powered vehicle which broke the European World Record for speed, beaten by only NASAs team in the World Record speed test at Indianapolis, USA. The "Sidewinder" was also a brainchild of Dad & Alan. This was a device incorporating a folding tray with a 3rd wheel to get over maximum CC rules on motorcycles in the UK. As the accident repair work got slower in the mid eighties (big Insurance Companies taking too many jobs) Dad decided it would be a good idea to start specialising in a specific model. He was quite impressed by a BMW 2002 that someone had bought in for some work. They found it hard to find a lot of the spare parts required for this model and thought that maybe there was a gap in the market to supply parts for these nippy and fun German sports saloons. A future classic? As the 2002 knowledge grew in North Norfolk, I did too. Many good and also some slightly scary memories are embedded in my mind. I occasionally got to go out with Dad on accident recoveries and help with turning on the flashing lights and do the winch buttons which was all good fun. One time when we had a truck with an arm lift on the back I was sitting happily in the cab waiting to go home while Dad was offloading the latest recovery. Suddenly I found myself and the truck flung 90º sideways, heavy chains & other cab paraphernalia flying past my head. "Daaad?!" I said, clinging on to the seat for dear life. He had forgotten to put the stabilisers down before swinging the car over & off. Ooops! I’d often be found squashed up in the back of Dad’s supercharged 2002 Touring with not much room to move for boxes and car parts picked up from Germany and various trips to shows in the UK and in the Netherlands. I would later learn to drive in this Agave green wolf in sheep’s clothing. After midnight on my 17th birthday Dad made sure to take me out for my very first drive on the road! I’d had a bit of practise before in various classic BMWs in local cut corn fields – you can polish the underside of a 2002 really well doing this - and round perimeter tracks at many of the UK’s race circuits. At high school I always said I would never work for my parents or run my own business, knowing how time consuming and sometimes how stressful it was. I went straight from high school into art college on my portfolio hoping to become a Graphic Designer which was a good paying job for an artist. The fine art side of things swayed me away from any practical reasoning and I panicked and dropped out in my second year after completing an advanced GNVQ in Art & Design. My first paid art work was doing lots of photos and illustrations for Dad’s book The BMW 02 Restoration Guide. Meanwhile Jaymic, with the help of Dad’s busy mind, had been venturing into alternative fuels, namely LPG, which the UK government were starting to subsidise. Electric scooters & LPG systems were researched in great detail. Jaymic Aternative Fuel Systems grew quite big and busy rather quickly. Training Companies to install LPG systems & supply the conversion parts wholesale to a Dealer network. I had a few normal boring jobs but soon got invited to take a position at Jaymic doing admin and graphic design for the Alternative Fuels side of things with day release at college to learn more in Graphic Design. When one of the lads in the BMW parts store decided to leave for pastures new I was given the opportunity to take his place. It was a steep learning curve. I learnt a lot about the different suspension a steering parts of 02s on a 1:18 scale Kyosho model & having lots of regular scale 02s and E9s in the workshop in various states of repair helped in other areas too. Sometime early in 2004 my parents though it was about time to retire. Rather than selling the Company to a new owner whom may or may not want to keep on the employees – some had been there since leaving school – they decided to offer the employees a chance to purchase the Company. I was asked if I fancied the role to take over things but I felt I would not be able to cope at the age of 24. In the end the idea of splitting the Company into 3 separate ones came up, there being 3 specific areas: BMW Workshop, BMW Parts & Alternative Fuels. I had been saving up to go away on my first holiday alone to Central America – somewhere I’d dreamed of going for a while. In April 2004 I did just that which gave me 3 weeks, on my own in my own space, to really reflect on what I wanted to do: continue with the BMW parts with me running things, or try and find a new career. After much deliberation I decided to go for the challenge of running my own business with the assistance of Rob (the then stores manager). I knew it was a business that worked and it came with a regular customer base. Splitting the Company into three separate ones took some planning, on paper with accountants, banks and solicitors, and physically with the logistics. The site and workshop at Cromer Station Yard was only really big enough for two units so in preparation we cleared out the half of the barn, where my parents live, which had been used for the old stock parts storage & his seven car garage to make way for the BMW parts stores, office & a self contained flat for me (I’d previously moved back in with them to save for my trip). It was quite a leap for me and to be honest a bit scary but I wasn’t alone and had Rob to help run the shop & my parents just next door if I needed guidance with anything I wasn’t sure about. So I’m pleased to be here twelve years on and still shipping classic BMW parts all over the world. I’ve not got bored of it, which was one of my concerns initially, and not run the business into the ground, yet! I think one of the best things about our business (I got my husband Pete involved not long after we met in 2005!) is that its's not just the cars we love but the also people who cherish them. Some have become life-long friends. It's good to chat with someone whether they come from the UK, mainland Europe or the other side of the world and talk about our familiar joys and troubled! Sometimes I don’t look forward to a weekend BMW show as it feels like ‘work’ but once we hit the road in our trusty 2000 Touring (Bongo) you get a grin on your face & remember why we all do this. 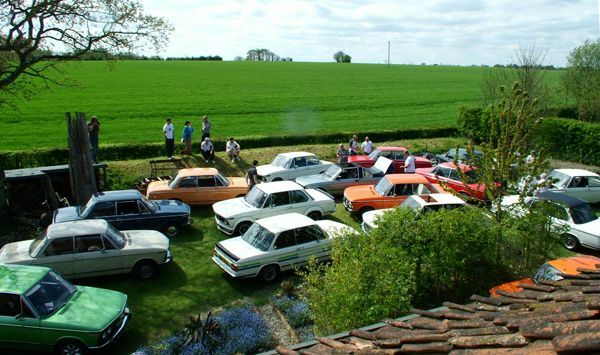 It’s great to share the love of these fun little cars with the diverse but like-minded people they bring together. Long live 02s, their followers & their keepers!